World production and consumption have been increasing rapidly in recent decades due to global ‘westernization’. While socially this can mean a higher standard of living for many in the developing world, the results are mostly negative on the local, national and global natural environment. For example, global transportation has increased the consumption of fossil energy, causing an increase of carbon dioxide in the atmosphere, which has in turn increased the warming of Earth’s climate. Investors want returns on their investment, so capitalism requires growth; a drive towards increased production and expansion into other ‘markets’ necessitates increased use of energy and natural resources. Greenhouse gas emissions are treated as an externality, not factored in to a firms expenses. This graph (figure 1) shows the amount of carbon dioxide in the atmosphere, measured in parts per million (PPM) Scientists now agree with 97% certainty that concentrations of carbon dioxide and other greenhouse gasses are the cause for increasing temperatures. For about 900 years, the amount of CO2 in the atmosphere remained relatively stable, but there is a rapid increase following the industrial revolution. 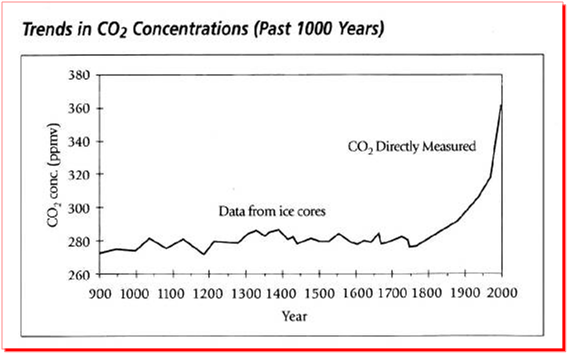 CO2 in the atmosphere grew from approximately 270ppm to 390ppm between 1900 and 2000, a 44% increase. This trend appears to be increasing, with CO2 recently reaching 400ppm. This has massive negative effects beyond just warmer weather. Looking at this graph (figure 2), we can see that the frequency of natural disasters such as drought, extreme temperatures, famine, flood, insect infestation, landslides, wild fires and wind storms had been relatively stable for centuries, but began increasing slowly from 1900 to 1960, and then started rising rapidly. Within only 40 years, from 1960 to 2000, the number of disasters per year went up from around 30 to 425, that is an increase of more than 14 times. 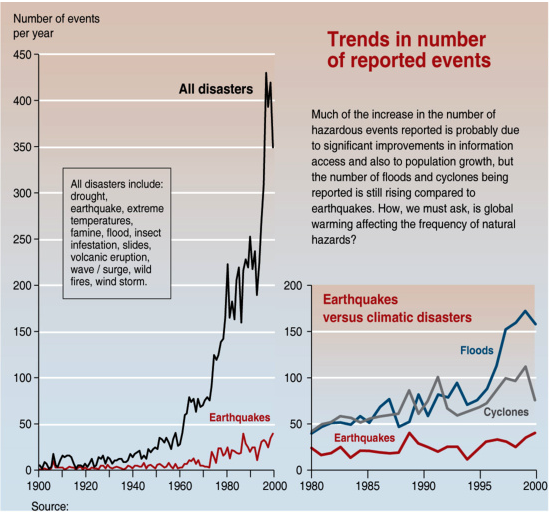 Much of the increase in the number of events reported is probably due to significant improvements in information access and also due to population growth, but the number of floods and cyclones being reported is still rising compared to earthquakes, which could not be affected by the climate. According to a case study from the Himalayas in India, a glacier will advance in a healthy climate and retreat in response to a warmer climate. Before being affected by climate change, glacier length records were at maximum from around 1700 to 1825, and then began to decline. As we can see in the graph (figure 3) there is a massive retreat from approximately 1825 to 2000. Alarmingly, this trend seems to be continuing. According to the latest studies, the average glacier thickness loss is approximately 30% from 1976 to 2012. 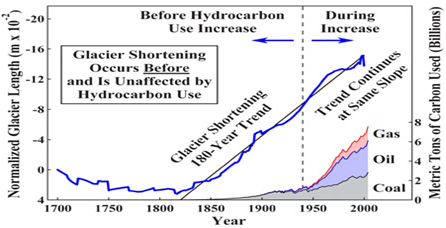 The loss of mass from glaciers contributes to increasing sea levels, along with melting polar ice. Sea level increased approximately 20cm from 1880 to 2000. This puts low-lying countries at risk, particularly island nations. Oceanic acidity increases as the water warms, affecting the delicate balance of ocean dynamics, and putting ecosystems at high risk. According to the Ministry for the Environment, the likely impacts of climate change on New Zealand include higher temperatures, though likely to be less than the global average, rising sea levels, changes in rainfall pattern (higher rainfall in the west and less in the east) and more frequent extreme weather events such as droughts (especially in the east) and floods. Agricultural productivity is expected to increase in some areas although others will run the risk of drought and the further spread of pests; forests and vegetation may grow faster, but native ecosystems could be invaded by exotic species. It is likely that there would be costs associated with changing land-use activities to suit a new climate; undoubtedly the costs of this shift will be passed onto to consumers at the supermarket. People are likely to enjoy the benefits of warmer winters with fewer frosts, but hotter summers will bring increased risks of heat stress and subtropical diseases. Drier conditions in some areas are likely to be coupled with the risk of more frequent extreme events such as floods, droughts and storms, rising sea levels will increase the risk of erosion and saltwater intrusion, increasing the need for coastal protection and glaciers are expected to retreat and change water flows in major South Island Rivers. People are aware of the dangers ahead, which is why at the end of November thousands of people protested against deep sea oil drilling on beaches across Aotearoa. Deep sea oil drilling has additional problems as well. While it may be too late to stop the planet warming by up to two degrees, it’s not too late to prevent further warming. That can be done though social movements like those behind the Banners on Beaches protests. 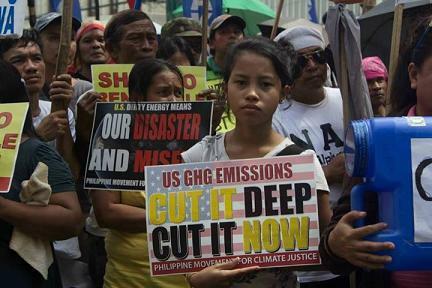 Social movements needs to align themselves with those who will be affected the most by climate change, who tend to be among the world’s most oppressed, people like Ioane Teitiota who recently attempted unsucessfully to become the first climate change refugee, or those affected by Typhoon Haiyan in the Philippines. These movements can be most effective by targeting the structural causes of climate change, which lie in our economic system.